Prices for crude oil settled at a 4 month low this week. As many of you know, the sales pickup stalled when crude oil prices began spiking earlier this year. 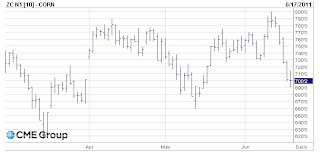 Moving in lock step with crude oil, corn futures began to dive from recent heights. Lower prices for corn and crude oil as we hit the busy summer season is welcome news for restaurants, hotels and caterers. Patrons will be able to fill their tanks for less money. Your invoice prices for meat and grain products will be lower. There's enough volatility in the markets to cover any recent menu price increases. We could use a few more weeks like this end of spring gift.